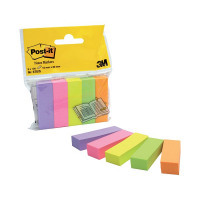 These colourful Post-it Page Markers are ideal for bookmarking pages and sections in books and catalogues. They are perfect for use in textbooks when studying, or in recipe books and brochures. With Post-it removable adhesive, you can easily apply, remove and readjust as necessary. This pack contains 500 page markers measuring 15 x 50mm in purple, pink, yellow, green and orange (100 per colour).